A beautiful ancient Chinese Sui Dynasty Tomb pottery figure! A very attractive figure in a fine condition for the age. An extremely rare large pottery figural group, dating to the Ming Dynasty. Set of two Chinese pottery seated pottery Officials, Ming Dynasty! Wonderful and scarce set of seated pottery officials, dating to the Ming Dynasty 1368-1644 AD. A pair of older men seated clad in blue robes and hats. As was costum each figure is a bit different from the other in the smaller details. Height: 21 cm. for each figures. 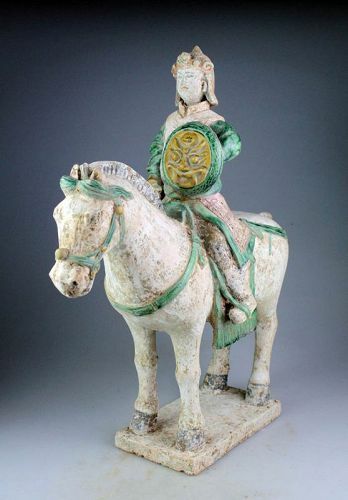 Huge Chinese Tomb pottery figure of a mounted soldier, Ming Dynasty! Superb style, massive pottery Horseman, dating to the Ming Dynasty (1364-1644 AD). Rare Chinese Ming Dynasty pottery horseman w. attendant! A high quality figural group of a horseman with groom, Chinese tomb pottery of Ming Dynasty, 1368-1644 AD. The figure is completely intact. Nice glazing and fine details in pigment. Ex. Danish Private Collection, bought at Copenhagen dealer in the 1990s. 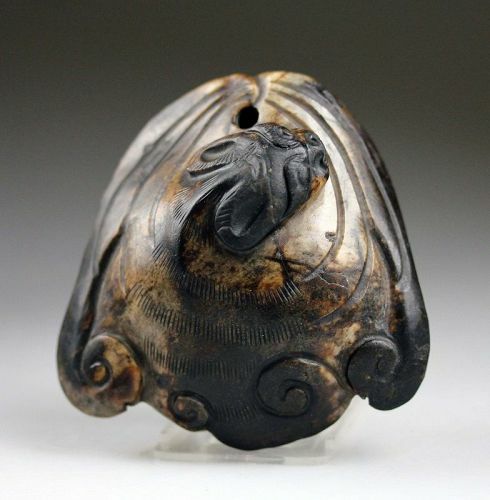 Museum Quality large Chinese Jade carving of a Bat, Song Dynasty! An important massive Jade pendant in the shape of a Bat, Song Dynasty, 960-1279 AD. The pendant is unusually large for Song and carved in white Jade with black and brown areas and inclusions. It depicts a Bat in a position of hanging from a ceiling with it's head turned up. The general style and execution is fantastic and this Bat is still the most accomplished ancient work of art in Jade that we've ever handled. 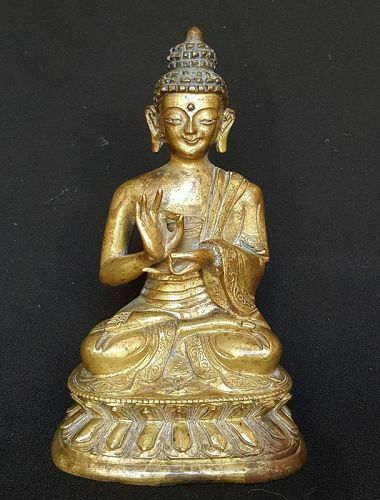 High quality Sino-Tibetan Gilt bronze plaque of Buddha! 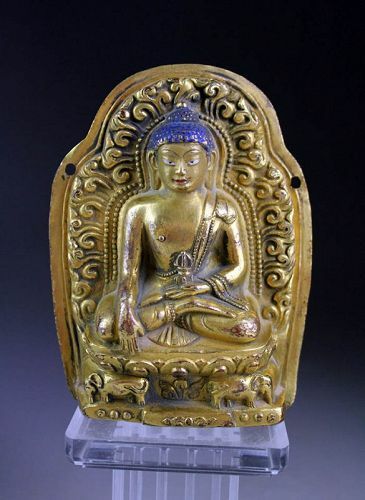 A beautiful antique Sino-Tibetan gilt bronze Temple plaque of the seated Buddha, Qing Dynasty, 18th.-19th. century. Buddha is seated on a Lotus Throne supported by two elephants, detailed floral around the full figure. Fine Chinese bronze figure of Buddha, Early Qing Dynasty! An early good style bronze Buddha, China, Early Qing Dynasty, 17th.-18th. century. The Buddha with fine features and very convincing old collection patina. The piece is guaranteed to be at least pre 1800 AD. Size: 15,3 x 9,5 x 7,7 cm. Small interesting inscribed Chinese bronze mirror w handle! Interesting bronze mirror which is either Chinese or Tibetan, dating to the later Ming-Qing Dynasty, 16th.-18th. century. 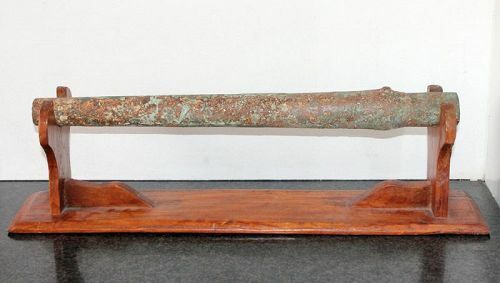 A rare large and authentic Yuan-Ming Dynasty bronze hand cannon! A rare and guaranteed authentic Chinese bronze hand-gun or hand-cannon, Yuan- Early Ming Dynasty, 14th. century AD!. Authentic Chinese Neolithic Jade bi disc in white jade! A superb larger Bi-disc in a fine white Jade stone, Qi Jia or contemporary culture, 3rd. millenium BC. Monumental Copper Alloy Phurbas & stands Mongolia, 18th.-19th c.
A pair of spectacular antique Buddhist temple Phurbas, Mongolia 19th. century. OBS! Note lot 1046 of the Sotheby's Indian, Himalayan and Southeast Asian Works of Art sale Including Property from the Estate of Dr. Claus Virch march 2015., where only one Phurba and Stand of the same type sold at £25.000! Take advantage of this very low price! 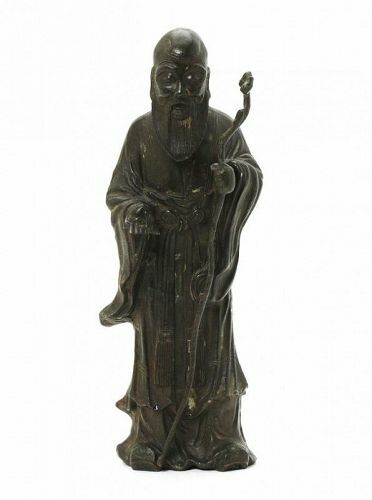 Rare large Chinese bronze figure of Shou Lao, Ming Dynasty! A very large and superb quality bronze figure of Shou Lao, the God Of Longetivity, also called the undying, China, Ming Dynasty (1368-1644 AD). A pair of Ming Dynasty Attendants 'fatman', 1368-1644 AD! 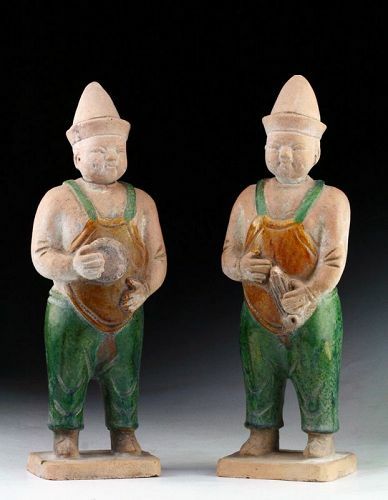 A very decorative pair of Ming Dynasty pottery attendants, dating to 1368-1644 AD. A rare type of attendants or workers, that we see very seldom. Strongly built, rather fat men with smiling faces. The attendants carry a box / shrine and a pibe in one hand respectively. They wear green overalls, and what looks like brown aprons. C. 26 cm in height - 10,1 inches. The glaze on both figures is very beautyful in color and depth. Impressive female Ming Dynasty pottery attendant on lotus throne! A large, Museum Quality pottery figure of a female attendant holding a plate with a severed Pigs head in front of her chest. The figure dates to Ming Dynasty, 1368-1644 AD. She wears a high head dress. Finely hand painted facial details. Lotus thrones are very rare for Ming pottery figures. XXL Chinese Tomb pottery figure of Officer Horseman, Ming Dynasty! Museum Quality massive pottery Horseman, dating to the Ming Dynasty (1364-1644 AD). Set of three superb Chinese Ming Dynasty tomb pottery attendants! A set of three beautiful pottery figures of attendants or officials, dating to the earlier Ming Dynasty, 1400-1500 AD. The figures stands on plints in fine two-colour blue & Torquised glazed robes. Details in red pigment and the high hat in black pigment. Finely painted facial details. The figures holds a beautiful chest, an incense burner and a large fan. Size: The figures measure c. 23-24 cm.